Even in cases where the conviction of an “aggravated felony” occurred before the crime was labeled as such in the Immigration and Nationality Act, most federal courts recognize that a past conviction for any offense listed as an “aggravated felony” under the INA will be grounds for deportation of the noncitizen alien. Congress is constantly expanding the list of offenses which are considered “aggravated felonies” in the INA, therefore if Congress adds a new offense in the future which qualifies as an “aggravated felony” and a lawfully present noncitizen has been found previously convicted of such an offense, the noncitizen alien will become immediately deportable, even if the noncitizen alien committed the offense before it was considered an “aggravated felony.” Additions to the list of criminal offenses which qualify as “aggravated felonies” will thus automatically be applied retroactively to prior convictions. Aggravated felonies are only one category of criminal offenses for which an immigrant can be deported. Noncitizens who have been convicted of one or more crimes of moral turpitude may also be subject to deportation, but are not necessarily ineligible for most immigration benefits in the same way as individuals who have convicted an aggravated felony. Most of the offenses that qualify as crimes of moral turpitude are also considered aggravated felonies. In addition, the immigration laws of the United States permit deportation for various standalone offenses. 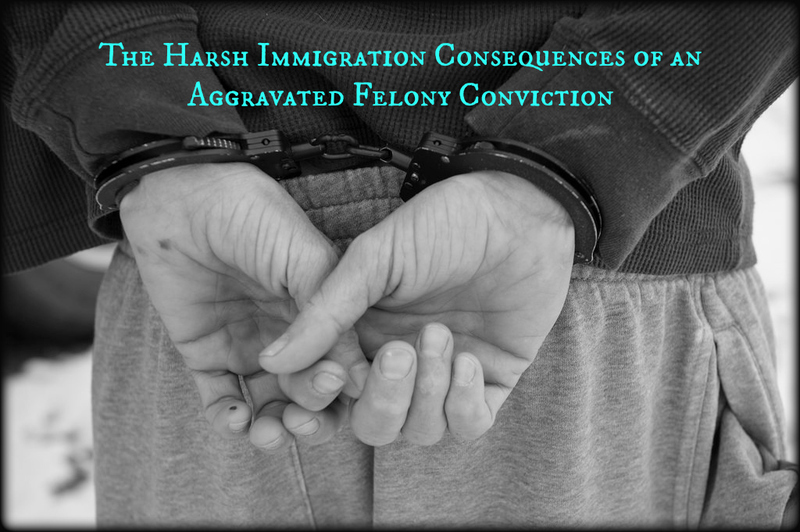 The aggravated felony classification is significant in that a conviction of an aggravated felony results in increased immigration penalties, and prevents individuals from qualifying for relief from deportation. Certain noncitizens who have been convicted of an aggravated felony are not afforded the same legal protections as other immigrants. As a result, certain noncitizens may be deported from the United States without a removal hearing. Under U.S. immigration law, an immigrant who has been convicted of an aggravated felony, who is not a lawful permanent resident can be administratively deported without a formal hearing before an Immigration Judge. Immigrants who are placed in removal proceedings are not eligible for asylum or other discretionary relief from deportation. Immigrants who are deportable based on a conviction of aggravated felony, who are not lawful permanent residents of the United States, may not appeal to the Board of Immigration Appeals (BIA). These persons may be removed from the United States within two weeks of a removal order entry. Noncitizens who have been convicted of an aggravated felony are not eligible to apply for asylum; a form of immigration relief based on a well-founded fear of persecution in the country of nationality or last habitual residence. Noncitizens who have been convicted of an aggravated felony are not eligible to apply for withholding of removal; a form of relief from deportation based on a threat on the immigrant’s life or freedom in the country of deportation. Noncitizens who have been convicted of an aggravated felony are not eligible to apply for cancellation of removal even if they assert that their removal would cause an exceptional and extremely unusual hardship to a U.S. Citizen family member. Cancellation of Removal is a form of relief from deportation authorized by an immigration judge to allow deportable immigrants to remain in the United States. Certain LPR immigrants who have been convicted of an aggravated felony will be ineligible to apply for a waiver of inadmissibility under 212(h) of the INA. The waiver of inadmissibility excuses the immigrant’s previous immigration violations so that they may seek admission to the United States. These waivers are typically available to LPRs whose removal would cause an extreme hardship to a qualifying relative living in the United States. Noncitizens who have been convicted of an aggravated felony are not eligible to apply for voluntary departure; a discretionary form of relief that allows deportable immigrants to leave the United States by their own recognizance, as an alternative to being formally deported by being served with a removal order. Arguably one of the harshest punishments for noncitizen aliens who have committed an aggravated felony is the punishment of being permanent inadmissible from the United States following removal or departure while a removal order is outstanding. A noncitizen alien who is removed or who leaves the United States faces permanent inadmissibility. These individuals may only lawfully reenter the United States by obtaining a rare and special waiver from the Department of Homeland Security, and must meet grounds of admissibility. Lastly, possibly the harshest consequence includes the possibility of facing imprisonment from up to a 20-year period, if the noncitizen alien has been removed from the United States following a conviction for aggravated felony, and subsequently reenters the United States illegally. For more information regarding deportation, removal, and exclusion please click here. As always it is our pleasure to discuss your immigration questions. For a free first time legal consultation please contact our office.